Festival wristband is cheapest and simple way for crowd command at your event. Festival wristband provide you an inexpensive, speediness and simple way for crowd command at your event. Of course, fabric wristband is the most creative present for office, exhibition, trade show, office, school or promotional events. Customized printed wristband are used as a ticket to recognize others at a party or a musical festival. It can not only be used in festival season but also widely applied in swimming pool, theme park, marathon, hospital management, membership management and loyalty program and other events. It is made from a special material,according with normal US standard and European Standard (such as woven or dye sublimated printing ) to custom and hard to be replaced. Because promo wristbands are made out of fabric, you can create some clearly detailed designs with festival wristbands. That will make the custom wristband wear more comfortable and attractive. Not only that but also you can make your intention deeply rooted in people ‘s mind and they will treat the cloth wristband as a souvenir after leave your events. These custom festival wristbands are available for both indoor and outdoor using and they are durable can wear for 5 days at least. 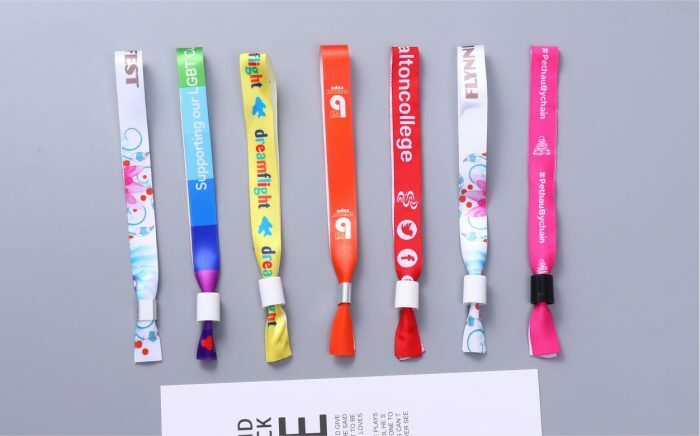 Sublimation process Or Jacquard process, you can pick your favorite production process to get your custom sublimation wristbands or custom woven wristbands.